When tying synthetics, it’s important to see the full picture. Near stacks can be complicated with multiples, and full stacks can mask the impact of AVO. 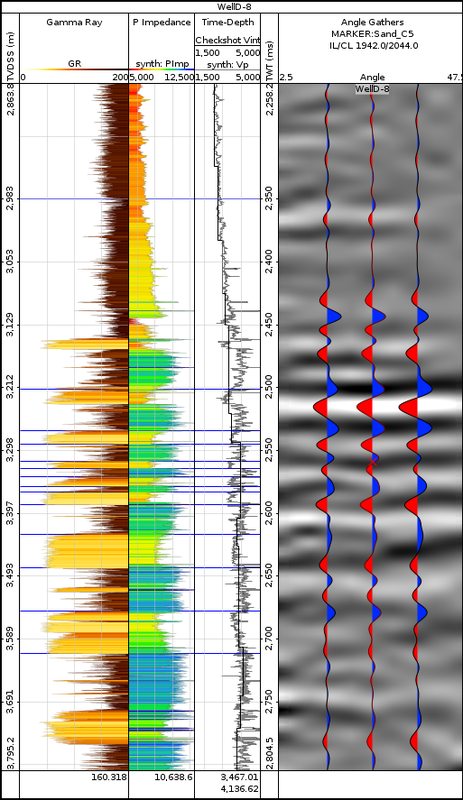 DUG Insight’s synthetics tool calculates synthetic seismic at any angle, and by incorporating gathers, we gain a better understanding of the well tie. 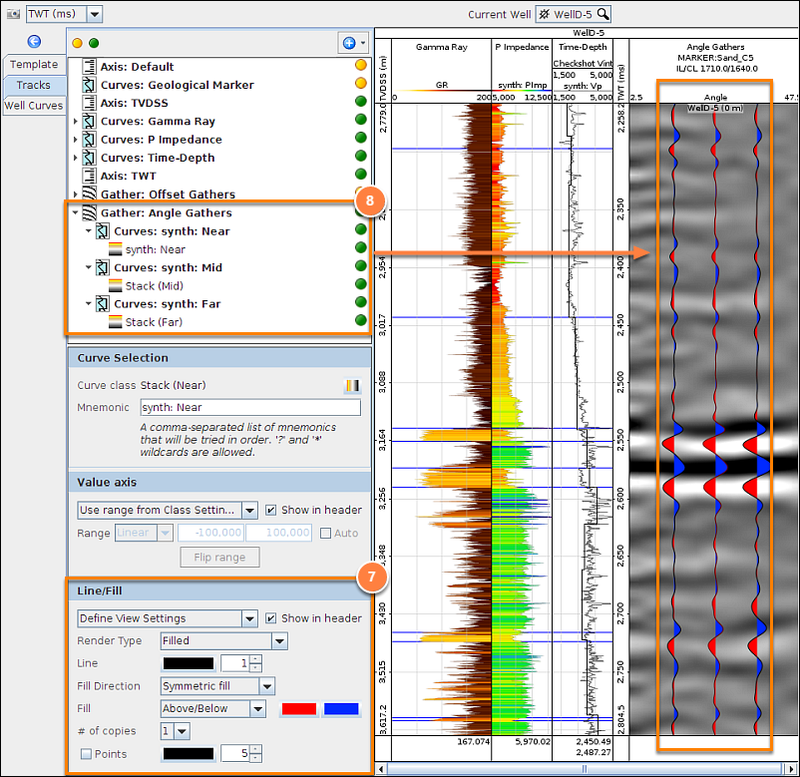 Using Insight’s Single Well View, we can overlay synthetic traces and other curves directly on gathers at the well. 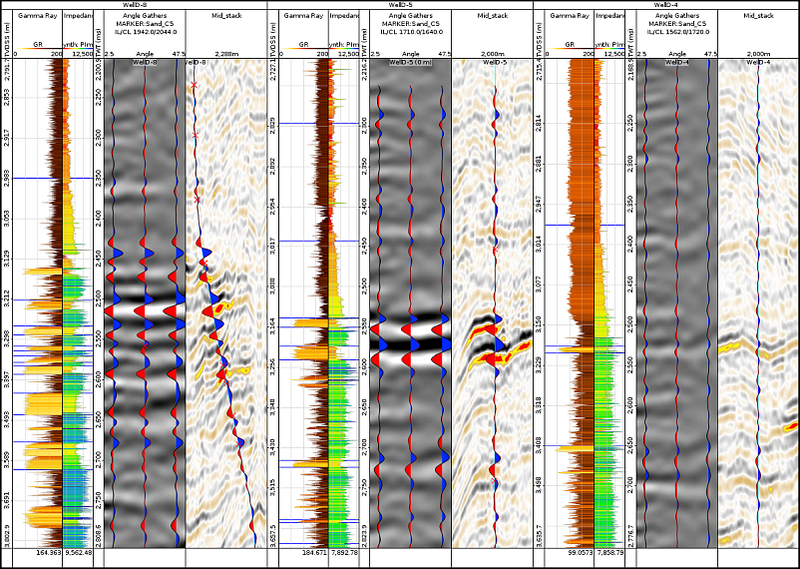 For this example, we have already calculated synthetics at three angles and overlaid them on traces extracted from corresponding seismic stacks (near, mid and far). These ties are quite good. Let’s build a synthetics QC display in the Single Well View to review them. First, we’ll open a new Single Well View and choose our well. Next, click the blue (+) and choose “Add Gather Track”. Configure the track by choosing the gathers to display. Tip: If you have access to the Explorationist module, then you can even create an on-the-fly Angle Gathers process to compare the angle synthetics to angle stacks directly! Finally, choose the location along the well to extract the gathers. For straight-hole wells, this doesn’t make a difference. 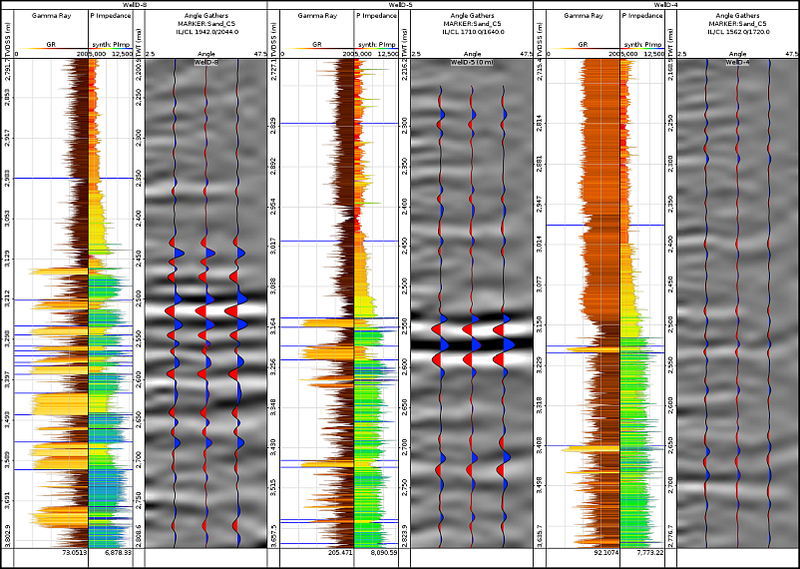 For highly deviated wells or horizontal boreholes, we should compare to the closest available gather to the target. In this case, we’ve chosen the “Sand C5” marker in the reservoir interval. Create and configure a track for each of the synthetic traces. To quickly create a new track for a specific log curve, go to the Curves Tab. Find your synthetic outputs and drag them into the display, between two tracks. Update their configuration (as shown) to fill the synthetic. Using the tree in the Tracks tab, drag the new curve tracks onto the Gather track. The tracks will be nested below the gather track, and will display over the top of the gather. 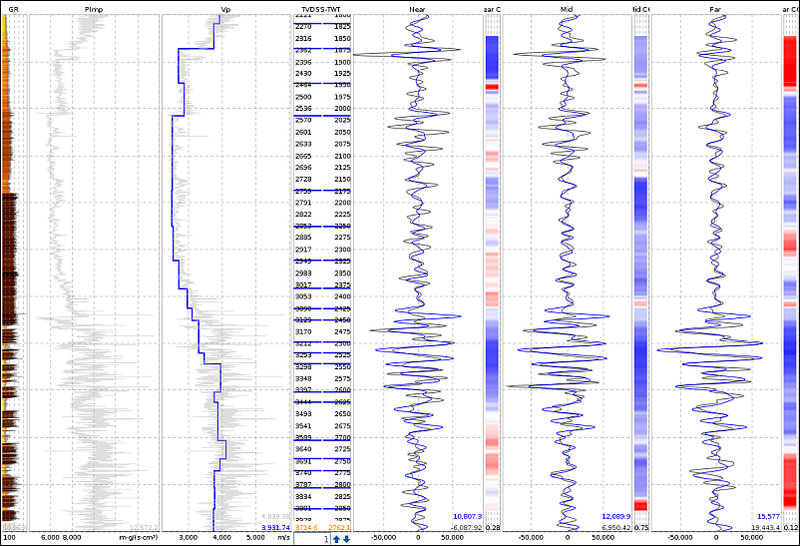 We now have a comprehensive QC view for comparing synthetics at a single well. Using the well selector at the top of the view, we can flick between wells and confirm the quality of the ties across all the wells. It looks like the results at Well-5 are quite good too! Everything is linked, so changes made elsewhere are updated in this view in realtime. For example, we can adjust the well’s time-depth pairs in the synthetics view, or even change the wavelet frequency, phase or amplitude. This is a great way to finely tune our ties and achieve the best results. Let’s use the Well Correlation View to build a summary for reporting. We can save a lot of time by reusing the display that we’ve built. 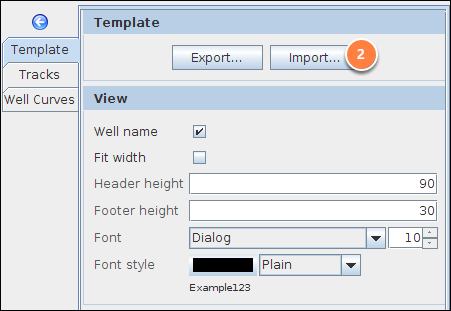 From the Template tab, choose Export and save the template to a file. 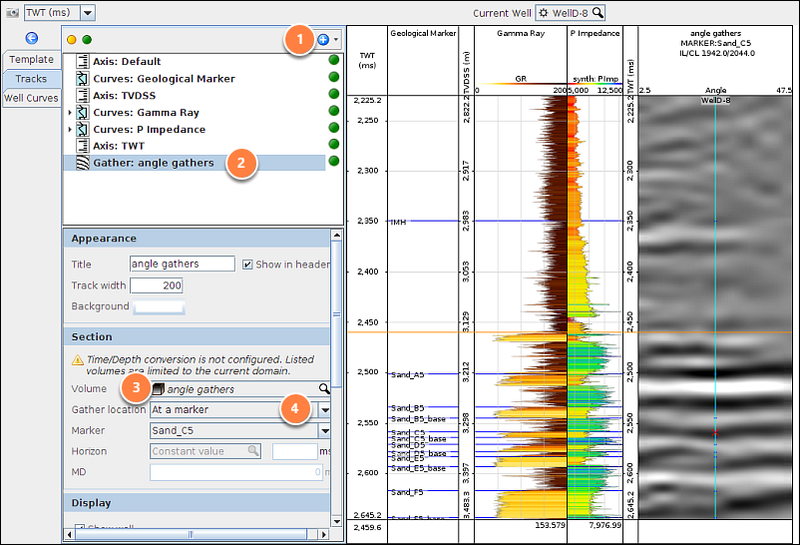 From the Control Panel / View menu, open a new Well Correlation view. In the Display tab, click Import and choose the template file we just saved. In the Well Selection, choose “Show selected wells”. Add a row for each well and select it. Finally, we can add a little context by including a seismic track. In the Volume configuration, select a stack to compare against. In the tree, choose one of the synthetic Well Curve tracks currently nested below the Gather Track. 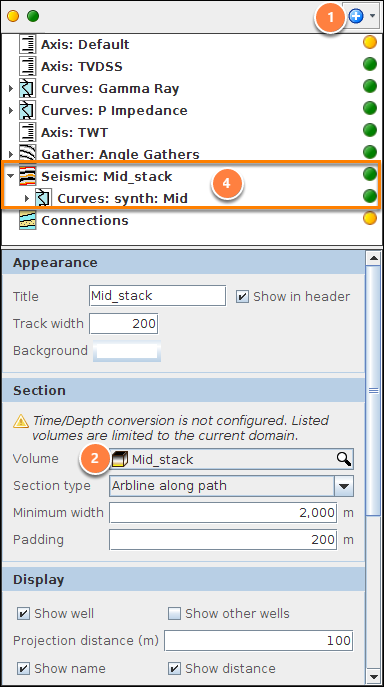 Make a copy of the track by holding CTRL and dragging the track onto the Seismic track. 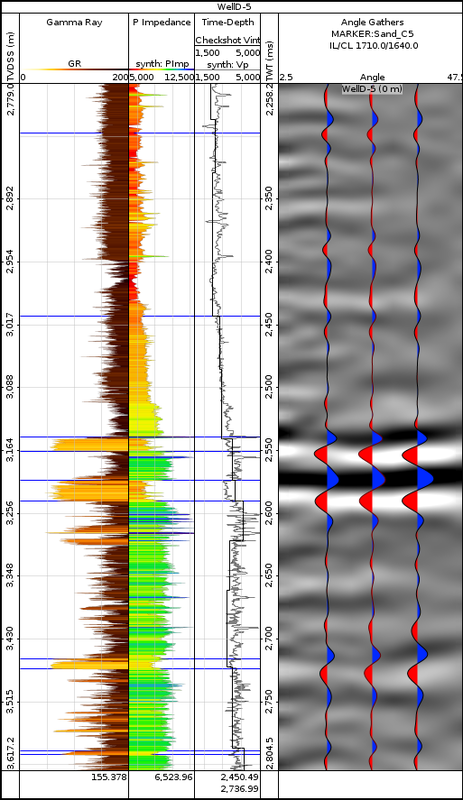 In just a few clicks, we’ve added a seismic track containing the Mid stack and copied the mid-stack synthetic track from the gathers.